The 474th Soundtrack of the Week isn't much to get excited about. 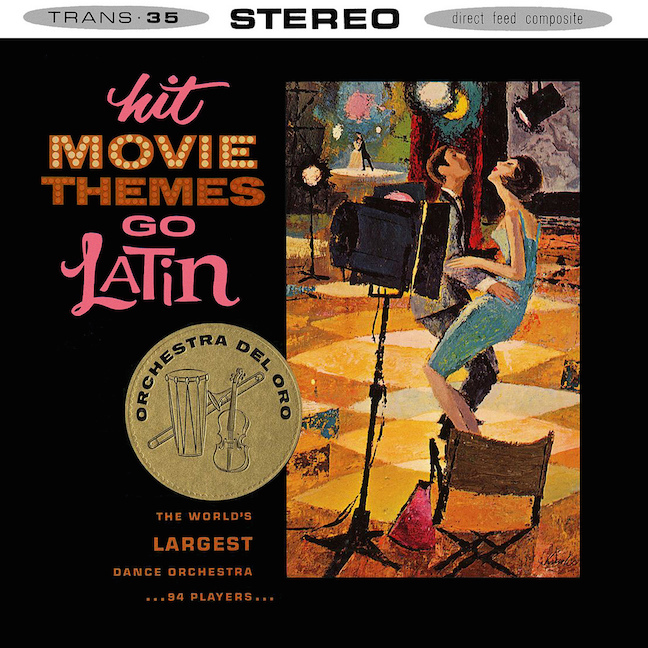 Hit Movie Themes Go Latin by Orchestra Del Oro (Juan Del Oro, conductor) sounds like a good idea but it doesn't deliver much. It's a collection of Academy Award-winning songs and themes, from Gone with the Wind to High Noon, Gigi to Exodus, arranged in a tepid easy-listening style with lots of strings while Latin percussion provides the platform for the melody. The curious thing about this record, which I bought last month for $2.99 at In Your Ear in Harvard Square, is that it only has ten songs on it, as opposed to the twelve you'll find if you search for it online. No "Moonglow" or "Third Man Theme" on here, but also no "Ruby" or "Song from Moulin Rouge". Which means four missing songs not two, but the difference is still between ten songs and twelve. And the reason for that is that this pressing, which also has some typesetting pronlems, has "Prince Igor" and "And the Meek", both apparently missing from the other LP. A mystery! But a mystery worth solving? For now I'm saving it for a rainy day.